A woman is suspected of poisoning twenty-one people, including her family. Fifteen men steal a huge sum of money from a moving British train. Mobsters massacre a rival gang with machine guns. These crimes may seem to be ripped from the pages of a novel, but they are very real - and they were all solved using forensic science. Ever since the introduction of DNA testing, forensic science has been brought to the forefront of the public's imagination, especially because of popular television shows like CSI: Crime Scene Investigation. But in reality, forensic analysis has been practiced for thousands of years. Ancient Chinese detectives studied dead bodies for signs of foul play, and officials used crime scene photography and criminal profiling to investigate the Jack the Ripper murders. Since then, forensic science has evolved to use the most cutting-edge, innovative techniques and technologies. 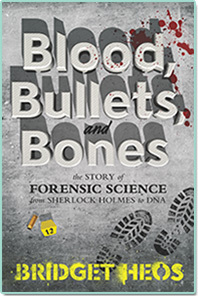 In this book, acclaimed author Bridget Heos uses real-life case examples to tell the fascinating history of modern forensic science, from the first test for arsenic poisoning in the 1700s to fingerprinting, firearm and blood spatter analysis, DNA evidence, and all the important milestones in between. By turns captivating and shocking, Blood, Bullets, and Bones shows the essential role forensic science has played in our criminal justice system.